SAN QUENTIN  A condemned murderer who was one of just 16 inmates on Californias Death Row to have exhausted his appeals died of unknown causes, prison officials announced this week. San Quentin officials are investigating the death of Fernando Belmontes, 56, but say there was no obvious cause. More details about his death have not been released. 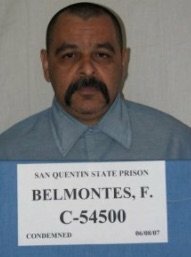 Belmontes was one of 16 condemned inmates  out of Californias nearly 750  who had exhausted his appeals. As such, he was considered a top priority for execution. Belmontes was sentenced to die at 20 years old, a year after he murdered 19-year-old Steacy McConnell during a 1981 burglary. It started when he and two others broke into McConnells home in San Joaquin County, just east of Lodi. Belmontes, who was living in a halfway house at the time, bludgeoned McConnel 15-20 times with an iron dumbell, crushing her skull. In 1979, he had been convicted of being an accessory in a voluntary manslaughter, and he attacked his pregnant girlfriend months before the murder. California has executed only 13 death row inmates since 1978, including the controversial 2005 execution of Stanley Tookie Williams, a Crips gang dropout convicted of a double-murder whod written books to steer youth away from gang life. The most recent execution was in 2006, when Clarence Ray Allen was executed for organizing three murders while serving a life sentence for another murder conviction. Allen Spent 23 years on Death Row. Died of unknown causes? Bummer.. If he had just hung on a little linger..
We are more than just a Sanctuary State yaknow..
We are a haven for criminals, both those who sit on Death Row and those who sit in the Legislature and Gub's Mansion and now openly invite all comers ,, MS-13, Cartels, you name it.. Good luck, Citizens, You're gonna need it. So 16 inmates who have exhausted all appeals could be taken today and sent to their eternal rewards.. Why wait? Let’s have a mass send-off.. Maybe we could serve them some bad Chipotle and rancid wine from Pelosi’s vineyards. That should take care of them. Look at Pelosi. You know what they say about drinking too much of your own product. Was it botulism? You know, bad meat in the can . . .
No mystery, after 36 years, his bed frame broke and fell out and hit his head? The Devil got tired of waiting for him. Too bad gladiator death matches are unconstitutional. There was a movie from a long time ago where they did Death matches instead of the Death Penalty and showed it on TV.